Most gutter cleaning involves climbing up on a ladder and cleaning out the gutters by hand. When you have a very tall house, you will need a large extension ladder. Using extension ladders can be quite dangerous, and the risk of falling increases a lot at these higher heights. At some point, the risk of falling might outweigh the cost of having a service company come and clean the gutters for you. The other risk is that you may spend money on devices and tools you won’t be able to use properly or that will not work right for your situation. 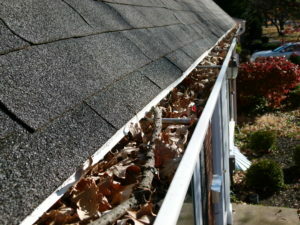 Gutters that are too high up may require some more advanced tools than regular gutters, when it comes to cleaning time. This gear can cost hundreds of dollars, and it’s not as simple to use as the regular setup. That money might be better spent on a company that already has the right equipment and can do the job more easily. Can You Clean Tall Gutters Yourself? The short answer is yes, you can clean your own tall gutters. But, you have to be willing to take on the risks mentioned above, which can be very substantial. Also, you will need a cleaning partner to make sure you stay safe on a tall ladder or to help you spot if you’re using a pressure washing machine. Tall extension ladders are best used when there is someone to hold them steady on the bottom. Since the simplest way to clean out gutters is by hand, this is possible on your tall gutters, as long as you have the right size of ladder. However, if you’re at all nervous on a ladder or afraid of heights, this just might not be a great idea for you. The other suggestion for tall houses is to use a long pressure washer with a downward facing nozzle. While this can be helpful for cleaning out gutters while you stand on the ground, these tools are a bit difficult to manage. Plus, as mentioned above, the money spent on the tool may not really be worth it if you only use it every once in a while to clean out your gutters. Sometimes tall houses have even longer downspouts. This is the forgotten downside of cleaning gutters for tall houses. If you are not prepared to clean out downspouts, you may not want to consider doing the job itself. But, if you’re determined, you can check if the downspouts even need to be cleaned at all by running some water through the gutters and down the spouts before you begin. Previous: Previous post: What is the Easiest Way to Prevent Clogged Gutters?